Six Senses Laamu is located on the privately owned Olhuveli Island in the Laamu Atoll, towards the south of the Maldives archipelago. From the gateway to the Maldives – Male International Airport – it is just fifty minutes by plane to nearby Kadhdhoo Airport and then a twenty five minute boat ride to Olhuveli Island. Six Senses Laamu is the only resort on the virtually uncharted Laamu atoll, deep in the Indian Ocean. The island is of outstanding natural beauty, powder white sand, lush tropical vegetation and crystal clear waters. 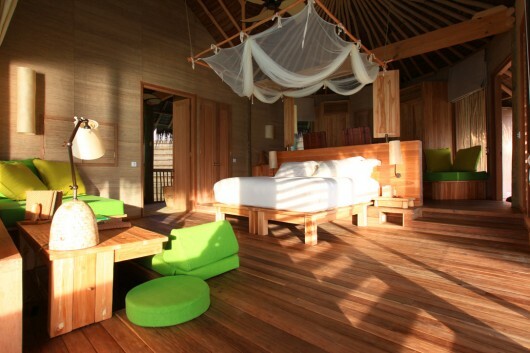 Its villas are eco-friendly yet luxurious in every way and sit on the beach or over the turquoise water of the lagoon. The bars and restaurants offer the best organic, fresh food, locally grown and caught, cocktails inspired by original ‘tropical’ recipes, over 400 wines kept in a climatically controlled towering glass wine ‘cellar’ and fun: live music, visiting DJ’s, mixologists, chefs and winemakers. Six Senses Laamu has 97 Beach Villas, Two Bedroom Beach Villas with pool and Water Villas. Carefully designed to complement the outstanding natural beauty of the island, they offer utter privacy, comfort and luxury. True to its philosophy of environmental protection, the villas are made from local and sustainable materials along with every possible thought for the comfort of our guests. Six Senses Laamu’s restaurants and bars have been designed to take maximum advantage of the islands idyllic beauty with panoramic views and spectacular sunrises and sunsets. 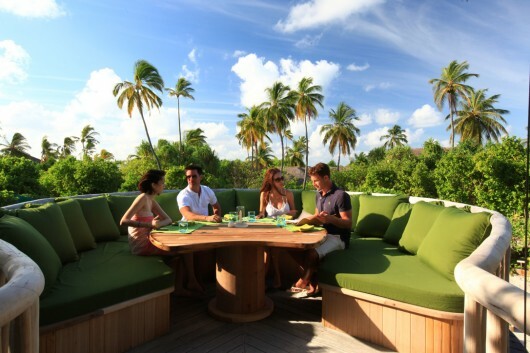 Most are over the water making Laamu’s restaurant and bar scene the largest of its kind in the Maldives. Sitting on the beach, the Six Senses Spa offers five secluded treatment rooms plus two single and two double treatments nests within the island’s natural vegetation. Highly skilled Six Senses Spa therapists use fresh natural products to provide a comprehensive range of award-winning signature treatments plus rejuvenation specialties of the region. Visiting practitioners offer our guests lifestyle consultations and specialized holistic treatments some which include acupuncture, cranial sacral therapy, reflexology, acupressure, Reiki and shiatsu. 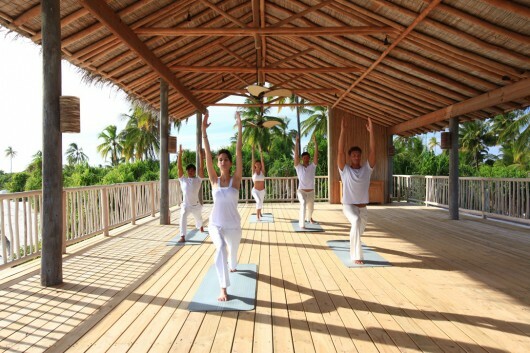 Our spa facilities also include herbal steam, outdoor experience showers, breathtaking Yoga Pavilion, Fitness Center, and a Six Senses Spa shop to enable our guests to prolong their enjoyment of our spa products after their treatment. Jungle Cinema is the open-air cinema. Movies, popcorn and cold champagne – what’s not to like!